The MA VPU (Video Processing unit) which has been on the market for some time recently underwent a complete technology change. MA’s product manager Rene Berhorst, accompanied by managing director Michael Althaus, presented training at DWR Distribution, South Africa recently. It was aimed to bring users up to date with the power of MA VPU over an intense three day period. "The MA VPU is the right video tool to offer users," commented Althaus. "And judging from the good feedback, it really is exciting what is achievable. " With the updated MA VPU, MA Lighting have provided answers to all user requests and added some powerful features and the MA software release 2.8. "The MA VPU has many functions and possibilities and is an ideal tool for lighting people," said Althaus. "As key users already know the grandMA2, they don’t have to learn something new. This makes it quick and easy. Next to the functionality, it’s the integration we are highlighting. Setting up the server takes fifteen minutes." 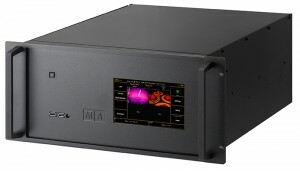 The MA VPU allows videos to be displayed in Full-HD or HD and the internal synchronization of the MA-Net2 ensures the highest frame and DMX synchronicity. Horizontal and vertical soft edge blending as well as keystone correction help to scale videos to any size desired and all in all it’s a great solution for controlling, live accessing and altering videos, still images and 3D objects in real time. Images can be scaled, positioned, tiled, coloured and manipulated directly from any grandMA2 console. It is as simple as controlling any other fixture – the MA VPU just has to be added to the network session. Nick Britz from DWR Distribution, who oversaw the training, was also in attendance. "One thing I can say about MA is that they listened to us as suppliers, and to the end users. Everything we asked for they have put in and more. They really know their stuff." For trainer, Rene Berhorst, it was great to be back in the country and to once more meet up with everyone in the industry. "It has been fun," said Berhorst. "There were good operators and it was a little opportunity for them to see what was coming in, to show them the newly released software and to ensure they understood MA VPU."